Other names: Manketti nut, featherweight tree. Mongongo is a tree from the southern Africa. 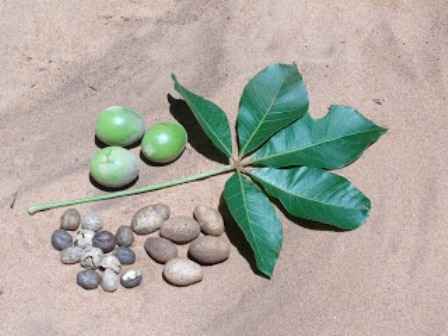 Archeological evidence indicate that this fruit has been grown by the San communities in Botswana and Namimbia for the past 7000 years. It grows wild in large numbers there in on sandy soils between latitudes 15 and 21° S in southern Africa. This tree has been planted as a roadside tree in Victoria Falls, where the Zambesi river falls off the arid southern Zambian plains at North western Zimbabwe. 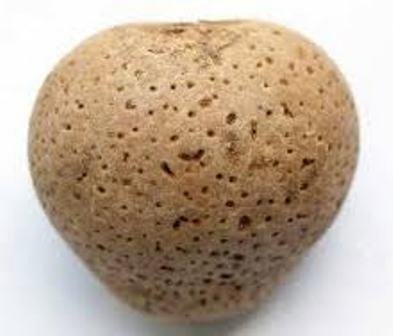 Mongongo has been introduced to Australia and Israel but the results are not known yet. Trials were started in Israel about 25 years ago to cultivate of this fruit alongwith some others in the Negev desert there. Though it is too early to draw a definite conclusion, but the initial experience seems to be encouraging. A large (up to 15 metres) deciduous tree, straight trunked, dioecious, and with a broad spreading crown. Leaves compound, dark green, 5 to 7 ovate to elliptical leaflets at the end of a stalk up to 15cm long, stalk. Flowers small and whitish to yellowish occurring in spray type inflorescences. Young fruits tomentose, rind hard and tough, brown at maturity; pulp spongy, green in the beginning but turning whitish brown at maturity, thin, constituting around 20% of the whole fruit, pleasantly aromatic and sweet. The fruits fall from the tree with the skin still green (variably, april to may), and matures on the ground. There, the skin turns brown, and the flesh softens and develops full flavor. Dried mature fruits taste somewhat like a date. The fallen fruits do not spoil and remain edible sometimes upto 7-8 months. The mongongo fruits abscise green when mature, and start ripening (skin color change to brown, flesh softening and taste development) a few days later. The pulp is eaten fresh. Some bushmen also dry the pulp and use it later. It can keep for months. The seeds are called a nut. The creamy yellow meat of these nuts is oily and nutritious. It is very good eaten raw and even more delicious when it is roasted. 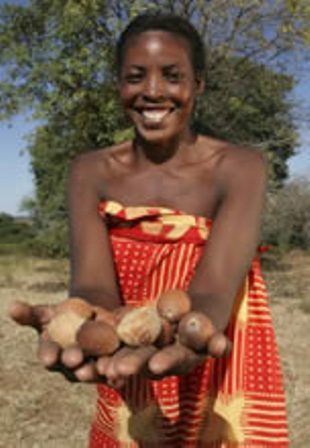 Indigenous people sometimes mix the nut meat with sand and red hot ashes from the fire, after which the roasted seeds taste like roasted cashews. Curiously, it is reported that roasted for longer, they then taste like ‘fine old cheese’. The fruits including the kernls, are rated as highly nutritious. It is estimated that a human adult can meet his 70 per cent daily energy requirement by eating 100 mongongo fruits. Nutritive value of 100 g kernels: Fat, 57 g (44% poluynsaturated, 17% saturated and 18% monounsaturated), protein, 24 g; calcium, 193 mg; Zinc, 4 mg; copper 2.8 mg; vitamin E, 565 mg.
Wood is very light and strong. It is used for making floats. 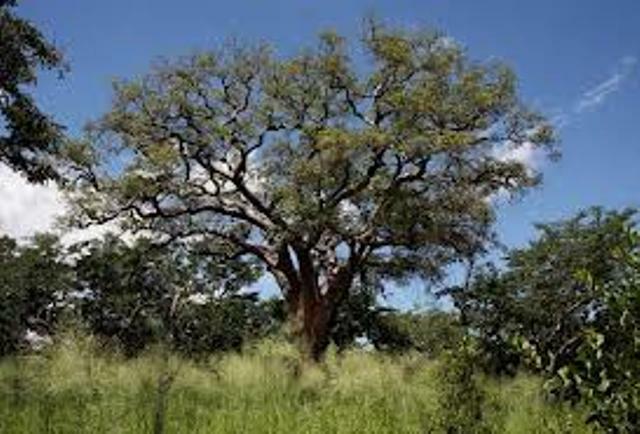 The Mongongo tree prefers hot and dry climates with low amounts of rain. It also prefers to grow in wooded hills and sand dunes. New plants are raised from seed. The seed germination is been found to hasten and increase after treatment with 2-chloroethyl phosphonic acid or Ethephon. The seedlings, however, take around 25 years to commence fruiting. This is the most discouraging factor in the introduction of this tree into other parts of the world.